The Guitar ONE is the first biodegradable environmentally friendly one-step answer to effortlessly achieving a show-perfect shine. An ultra slick, streak-free, high shine gloss magnifier, organically formulated to clean, polish, wax and protect for gloss finishes. The Guitar ONE is infused with white Brazilian carnauba wax that delivers an acoustically transparent durable shield with a high gloss shine that protects your instrument's finish. Safe on all lacquer finishes including nitrocellulose. Not recommended for matte finishes. 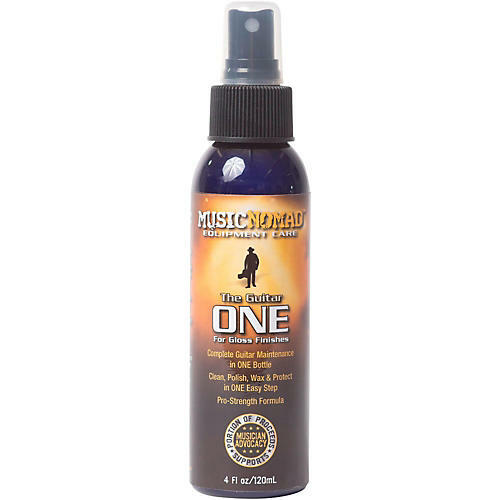 Musicians, repair shops, guitar techs, instrument makers and collectors around the world use this popular guitar care polish. The Guitar ONE makes care and maintenance easier without compromising on quality.